sometimes i wonder how the world knows. how it knows that we’re worn-down ragged, out of breath, slogging. sometimes i wonder how, just at the very minute and second we need the globe to turn just enough for light to fall at just the right angle, for warmth to rise, thermal watt building on thermal watt, sometimes i wonder how deep in the earth the stirring begins, and as the baby’s head crowning at birth, the tender resilient slips of green, of spring, come nudging their way through sodden leaf and over-stayed winter? how is this turning earth, this warming, awakening, how is it quite so intricately wired to the stirrings deep down in my heart? how, so often, does it answer the call before breath is put to the words? ah, but here’s the rub: it comes with no more sound, no more folderol, than it takes for a leaf to ease out of the way, for the rubbing-up of shoot against snow crust, against compost in the making. the coming of spring, the turning of season, comes in barely perceptible measure. you need to crouch down low. you need to step outside with intention, with searching. you need to scan the landscape, not from a distance, but close as your knees will bend. sometimes, you need to pull your hand from your pocket. you need to brush away the sodden. you need to play peek-a-boo with what’s birthed. 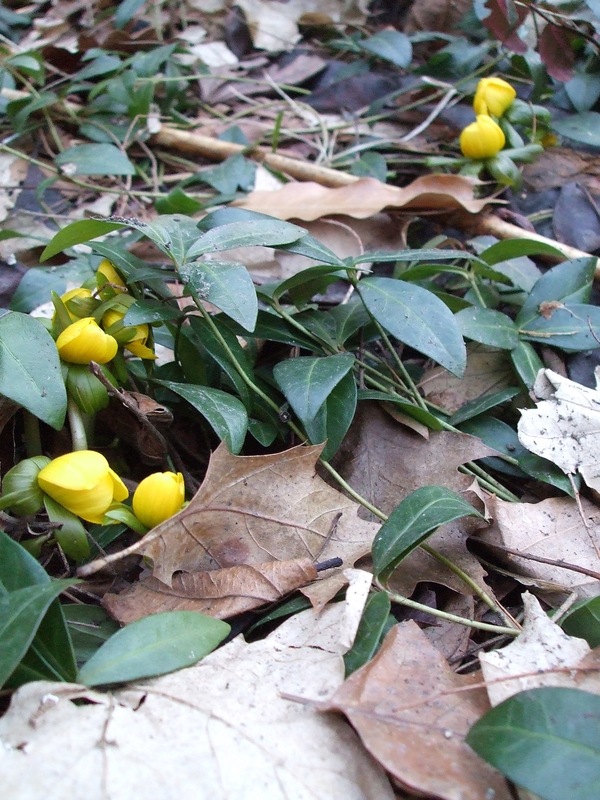 winter aconite, the nodding head of yellow, the one just above, it’s coaxed from its slumber by radiant light. light that barely perceptibly turns up the heat. shakes off winter. and indoors, too, you begin to get restless. you scamper around tossing out dried snips of winter. you trade up for pots stuffed with bulbs, bulbs with the girth of a garlic clove, bulbs that exist for one purpose: to shoot for the sky, unfurl, offer up color and configuration that befuddles the imagination. who thinks of these things, you wonder? who stacks bud upon bud, a pinecone-like stacking of color and softest perfume, the one that beckons the bees, brings on procreation of the pollinated kind. and so it begins again, the circle of life. of bursting forth after months of quiet, of stillness, out in the garden. after snow tumbling upon snow. and cold so cold a two-legged someone could barely survive. but the growing things grow. the winter does not strike them down, not most of them anyway. the birds come back on a river of wind. warm wind. the buds return to the branch. our hearts give a startle. pump with a two-step again. just when we think we’re on our last wavering gasp. spring comes. promise again. and so is written the script, the one that some of us need year after year, never quite learning its lessons fully enough, lastingly enough. we need to be knocked upside the head — knocked by the crocus and snowdrop and the quiet little aconite. professors masquerading as delicate petals. so the lesson is this: the season that comes after the long hard winter, the season that comes with the light and the slow-rising warmth, it is the moment when impossible surrenders. when we breathe in hope. fill our lungs with believing again. when all around we are stirred to remembering, rebirth will come. in one way or another, in ways expected or not. it’s our job to crouch down low. to inspect with intention. to note the stirrings, and breathe in the possible. the promise of spring comes on quiet, rustles just barely. it demands our attention, those of us who are taught by the turning of season. soon enough it will rise to crescendo. but now, for those who listen to its opening measure, the spring is whispering the promise of delicate but most certain hope. have you been out inspecting for springtime’s awakening? and if so, what’s tickled your fancy? How quiet we have to be to hear the whispers sometimes! Thank you, bam, for the gentle amplification. I’m whispering prayers up, out, wherever they will be heard. Haven’t seen snowdrops or crocuses yet here, but the light, well, the light just lifts me. That, and the slate blue sky. It’s such a delight to read your writing here each Friday. I feel like I’m sitting with you in your yard discovering the beginning of the season. 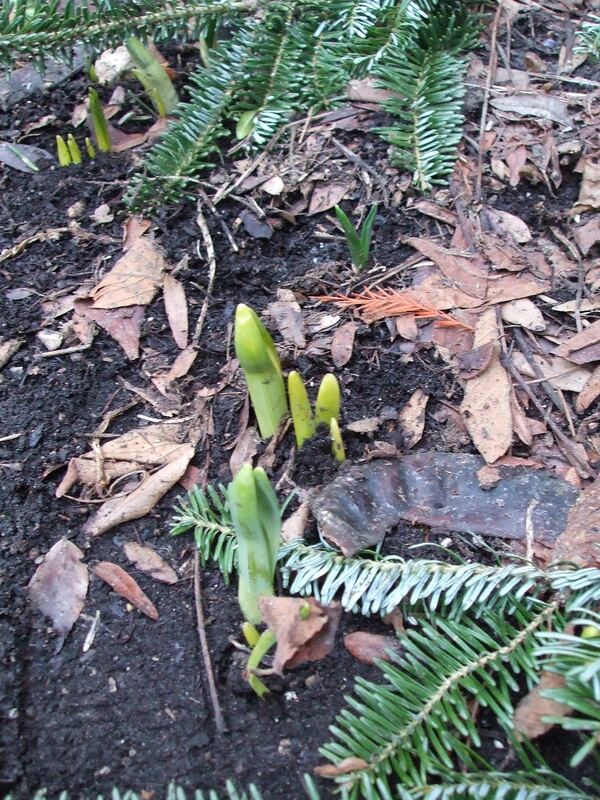 your snowdrops are coming, those blessed white drooping bells. they catch my breath every time. 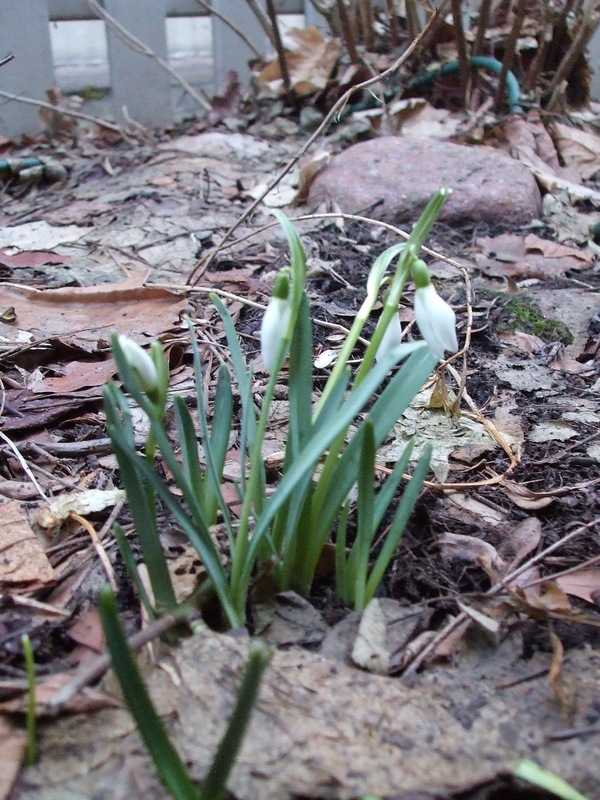 i’m not sure of your latitude, but mine now includes the snowdrops of spring…. I spent the morning in the yard, listening to the woodland chorus. The greatest joy of the morning was spying the sweet tips of crocus leaves emerging along the stones of our front walk, and daffodils poking through the soil on our south-facing berm. I walked down our back hill to the woods, rejoicing to feel the earth supple and giving beneath my feet. I loved walking on the hill so much that Christina Rossetti popped into my head, so I snapped a photo and posted her words with it just a short while ago. 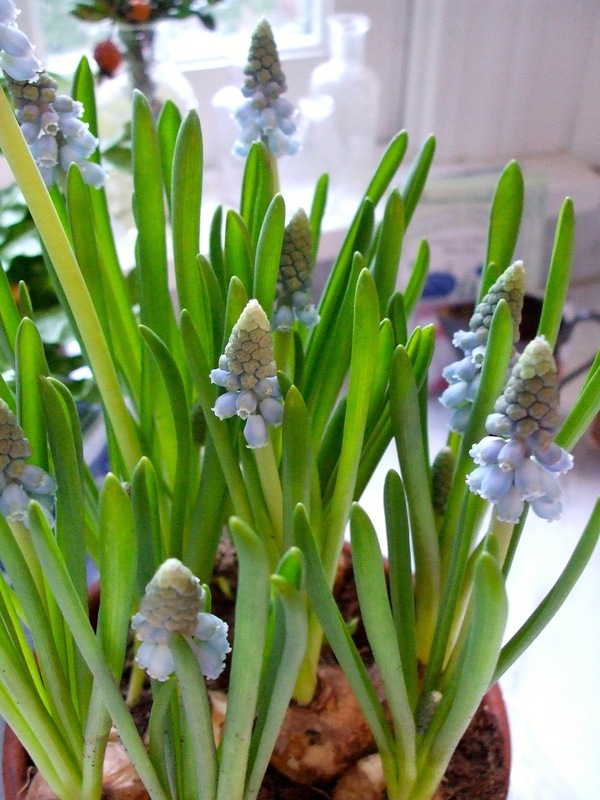 Happy, happy spring to you, my lovely friend! do you know how blessed you are, at big river’s edge, to have a back hill? what a poetic landscape…..
did you mean this beautiful post? Spring starts for me when the days become longer. Just when I think I cannot stand one more dark day. Then my horses start to shed and the birds come home and sing. The grass has more green than brown and all my trees are starting to make buds. I love how you pull us in to your own backyard and we can see what you see. It’s my weekly reminder to appreciate what is all around me. my beloved mother in law is right with you on deciding the turning point for all good things is the day the light comes longer. and when the clocks change, well, that’s the day she sends up bottle rockets. i love that you’ve brought horses, field galloping horses, to the table. whenever you mention them, i suddenly see them running in the fields. they are a wonderful addition here. we need a cow. pull up a cow. Too funny. I have cows in my neighborhood but not on my property.. Not enough acreage and one of my horses would call the Humane society on me if I put one out in the field. She really dislikes them. I cannot even believe your yard is awakening. Our lawn looks like the grossest sodden mess and we still have snow where the sun doesn’t reach. 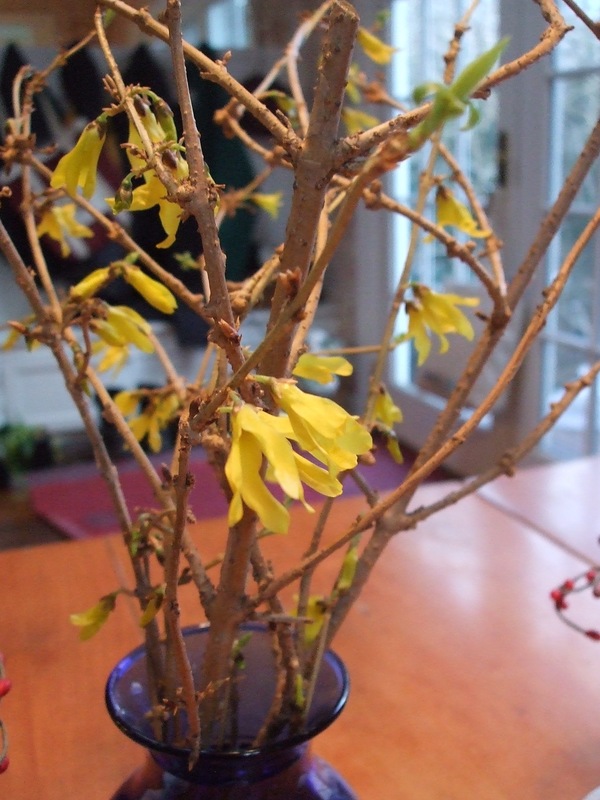 Only you, bam, could get wooden sticks to bloom on your kitchen table. Indeed, you remind me that even impossible says “I’m possible.” Love you. So blessings sent to all you pulling up to the table and may you find at least a tiny patch of woodland this weekend. beautiful beautiful. i LOVE the hellebores too. the white ones are my favorite, though the pale chartreuse are mighty jazzy too. love the poem. and now, a new word of the day: diapason. guessing it’s some part of an organ, and going to look it up…. 1. an organ stop sounding a main register of flue pipes, typically of eight-foot pitch. 2. a grand swelling burst of harmony. so often, mary oliver, the resident poet saint of the table, makes her way here. beloved lamcal just left this wonder on my doorstep (my virtual one, anyway), and it so belongs here amid the springtime conversation, amid the knowing that light and shadow are the twinned constants of this season of life and death and hope and rebirth….